KOEL Green Alternator : Built on globally renowned design. Patented winding design helps withstand operating harsh conditions. KOEL GREEN is the market leader and India’s #1 Genset Brand . KOEL’s customised power solutions suit a wide range of applications, meetingprime power requirements. KOEL GREEN Gensets are available in sound resistant and environment friendly canopies. KOEL GREEN high horse power (HHP) range is spearheaded by SL90 and DV series. Upgraded with carefully selected technologies to meet latest CPCB emission norms, both SL90 and DV series Gensets are the most efficient machines delivering clean power to large requirements. Having best-in- class fuel economy, the performance capabilities are further enhanced with best-in- class block loading. KOEL Green HHP Gensets are extensively used in a variety of applications ranging from standard stand-alone Gensets to auto synchronized Gensets, special applications like Stone Crusher to Heat Exchanger cooled solutions for basement installations. KOEL Green is celebrating 30,000 HHP Genset sales, a testimony of superlative product performance in most demanding applications and customer’s trust in the range . 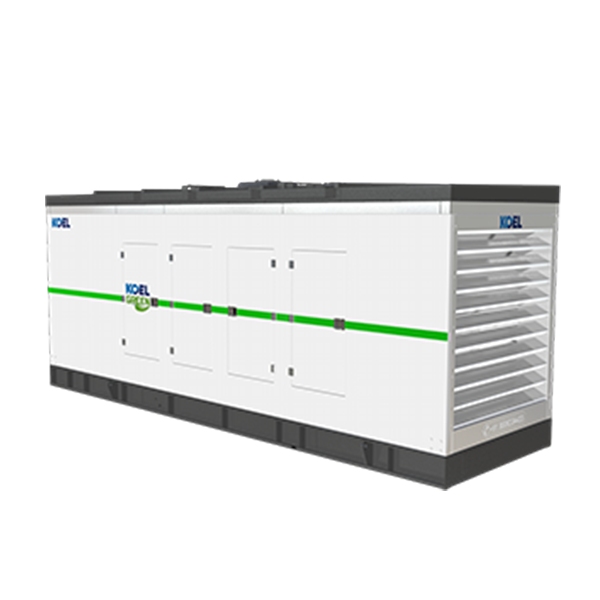 KOEL Green Gensets oﬀer a unique combination of CPCB norm compliance and enhanced fuel eﬃciency. Across the range, KOEL Green Gensets oﬀer substantial savings in fuel cost. Genset rangs are selected based on the present load and future expansion. Fuel eﬃciency of most Gensets is optimized at the full rating of the Genset. In practice, Gensets rarely get loaded to full capacity. Power demand variations across day & night, weekdays & weekends. Summer & winter lead to an average 50-70% loading on Gensets. Considering this practical situation, KOEL has extended fuel eﬃciency optimization from 100%, right up to 50% of rated load. Combination of best-in-class fuel eﬃciency & O2E provides a double advantage. There is no comfort like being in command. 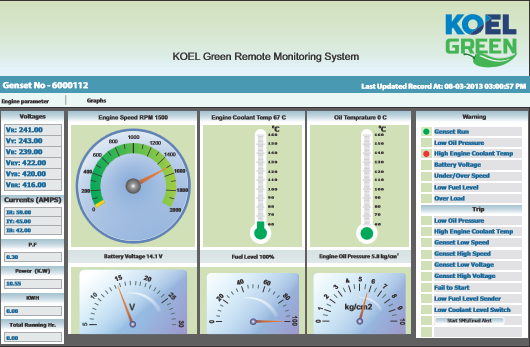 KOEL Green Gensets put the command in your hands. Micro-processor based Genset controllers display a host of Genset parameters and put all controls at your ﬁngertips. KOEL Green range carries the conﬁdence of well-established and proven engine platforms. For compliance to revised CPCB norms, KOEL has carefully selected those technologies which not only retain, but enhance Gensets durability and on-site serviceability. Thus, KOEL Gensets oﬀer you many years of trouble-free performance; backed by the assurance of prompt support. Peace-of-mind driven by product reliability and low cost of ownership. Your Genset now comes with complete remote monitoring control. Being in control of your own Genset is certainly a winning edge ! The KRM system links your Genset with a central monitoring data server through a SIM and internet. The complete monitoring panel with all critical indicators can be viewed on your laptop screen or mobile. You also get all alarms on your mobile phone. Genset Run hrs, Fuel level, Engine oil pressure, Engine temperature, Engine speed (RPM), voltage/ current/ kW, battery monitoring, PF & Frequency, routine maintenance indicator Critical Alarms: Low fuel level, low lub oil pressure, fuel theft, Engine speed, High Engine temperature, Mains On/ Off, Low/ High battery voltage. Your Genset will be used most efficiently as it's health meter will always be available at your finger-tips. Being a 'remote control' this health monitoring can be done from wherever you are from the actual location of the Genset. This close monitoring also helps in reducing your operating costs and enhancing reliability of the Genset you own. So in all, you have better return on your investment and enhanced productivity by maximum uptime. 3 times rated current for "10 sec"